UPDATE: I misunderstood the cost of the docomo data-only plans. I neglected to account for the ¥1,700 "data plan" price, which is a newly added base fee onto data-only devices. This over doubles the cost of data for a tablet and drastically changes the outcome of the below simulation. See here for a revised estimate. 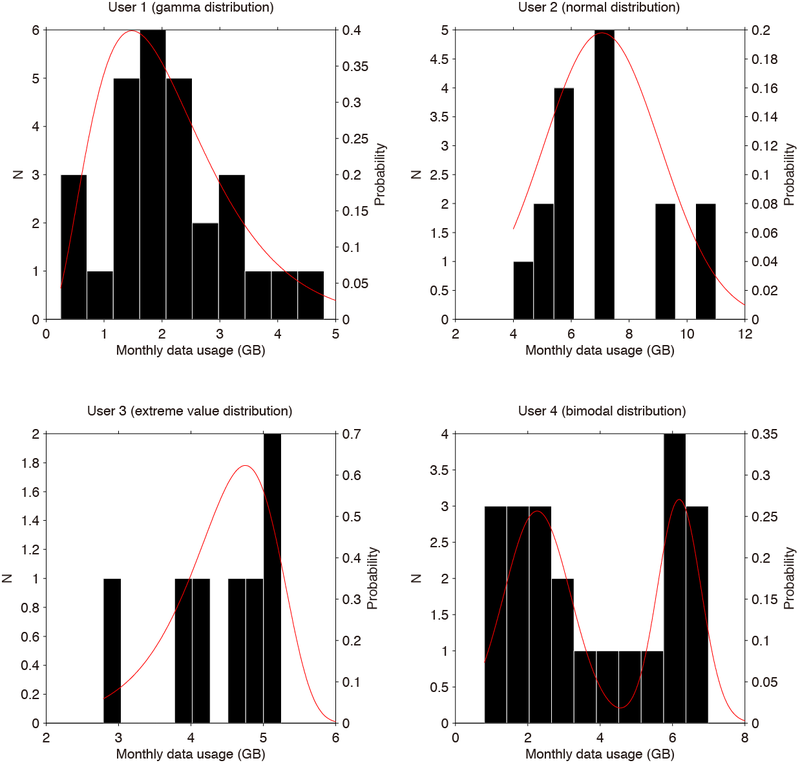 In the previous post, I described the effect of variable monthly usage on the total, longterm cost of a data plan. To keep things simple, I considered only one person (me) using one device (my phone). The outcome was that both the 5 GB and 2 GB plans (coming soon from Docomo) would be less expensive for me than just continuing to use my current 7 GB plan. There was a good chance that the 2 GB would offer the most savings, but only by a very modest amount of a few thousand yen over 2 years if I don’t modify my future behavior to minimize the number of times I would exceeding the 2 GB quota. 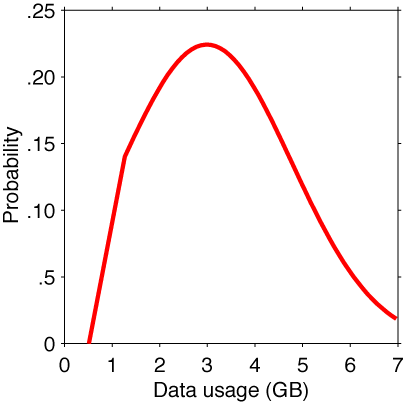 The above probability density functions (PDFs) show how I expect my phone (right) and tablet (left) to consume data in the future. The b-mobile FAIR SIM uses around 250 MB per month, often a bit less, so you can probably already imagine, based on the result outlined in my previous post, that canceling it would save money. 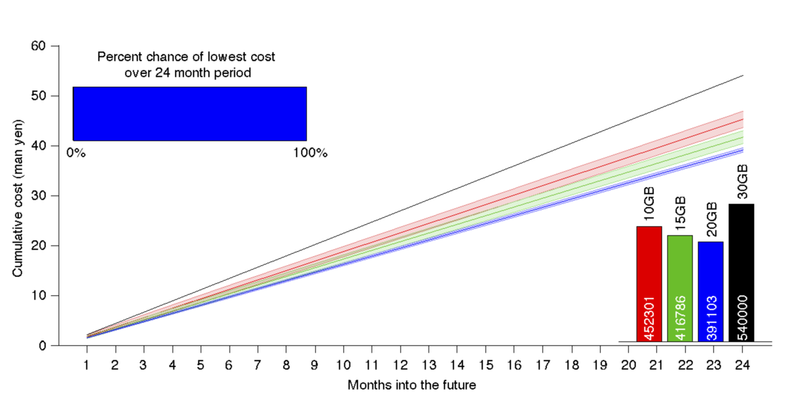 See this new post for new results taking into account the data plan cost. Below are the results of performing 100,000 simulations using the PDFs shown above. 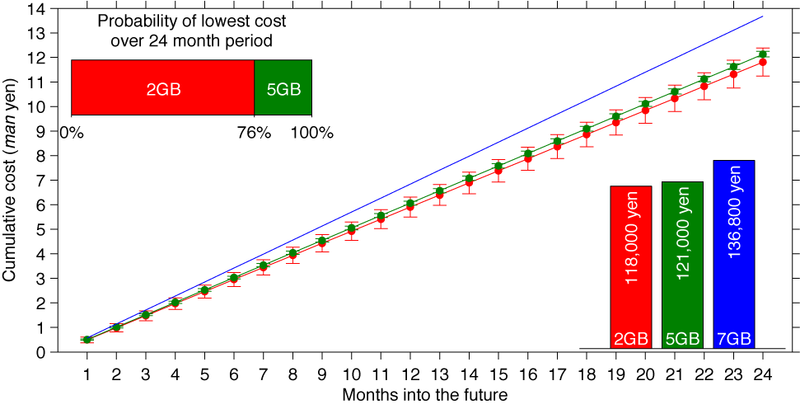 In 62% of the simulations, the 2 GB plan (red) works out to be less expensive than the 5 GB plan (green), but on average, only by a very very tiny amount (¥40/month!). The cost of having two separate plans from b-mobile and docomo jumps every four months, reflecting the recharge interval of the FAIR SIM. 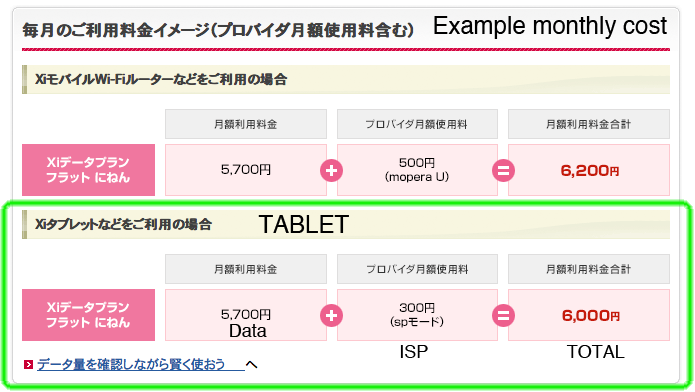 Not surprisingly, continuing to pay for two separate data plans has zero chance of being less expensive, and the total potential savings of combining the two devices onto one data plan is over ¥40,000 — enough for a new Nexus phone/tablet after 2 years. Though the 2 GB has a slightly higher chance of costing less in total, the mean cost of the 2 GB and 5 GB plans is virtually identical. The primary thing that I learn from this exercise is that my usage really fits neither the 2 GB plan nor the 5 GB plan; something in the middle (that doesn't exist, probably for this exact reason) would be the most effective. I am unlikely to exceed the 2 GB quota often enough to make the 5 GB plan less expensive. This indicates that If I made a conscious effort to reduce usage, I could probably save an additional ¥10,000 over 2 years (based on the standard deviation of the 2 GB result). On the other hand, I could continue using my devices as I do now, without really caring at all about how much data I consume. I could even increase my usage and still save money.